The bizarre supernatural tale of Hoichi the Earless (from Kwaidan) was given a surreal spin in a new interpretation by three innovative artists from Japan. 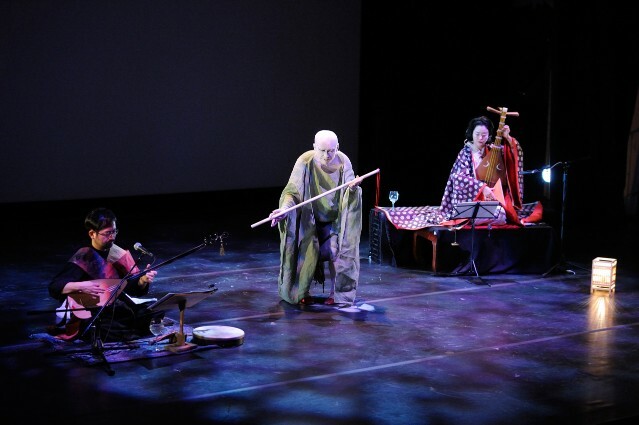 Akiko Sakurai, master performer of Japanese vocal music and Satsuma biwa (traditional Japanese lute); Kumotaro Mukai, renowned Butoh dancer from ex-Dairakudakan; and Kiyoshi Ohira, musical disciple of the Saz (Turkish lute) wove traditional and contemporary Japanese performance into a compelling new work which will have its world premiere at the Asia Society. This event was co-organized with Asia Society. Related Project: Sunday at the Met, Storytelling in Japanese Arts (February, 26, 2012) Akiko Sakurai performed Japanese literary work The Tale of the Heike (Performance starts from 1:24:30).